Watching my own kids while we camp leads me on a path down memory lane. When I think back to being knee-high to a grasshopper and camping, the one thing that was the same about every trip was how scary it could get once the sun went down. Some things never change. My kids always feel more secure when they have a flashlight with them. Well, the Play Visions company has come up with a way to make the night even less scary – they injected a little bit of Lego into it. Now your kids can have fun while conquering their fears of the dark. What kid doesn’t love Lego? I sure did when I was a youngster and my kids love it too! 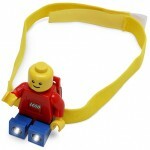 This Lego man headlamp will help your kids see in the dark while keeping their hands free to use. No more dropped and broken flashlights. No more flashlights falling in the toilet. Your child over 3 will be never be in the dark again. The nice thing about this headlamp is that the mini-figure is detachable. You can clip him to a backpack, jacket, or even your belt. Since the light emanates from the Lego man’s feet, and the legs are posable, you can light up two different locations at once. If the headlamp isn’t ideal for your child, they offer a few other styles of Lego lamps that may be more interesting to you. There is a portable lantern, a torch, and even a hand-cranked self-powered lamp! Each light utilizes a super-efficient LED so that you can maximize brightness and minimize battery changes. They also come in a variety of colors. Did I mention that batteries are included? Get yours from the links below! Need something a little more compact? Check out this Lego man keychain.